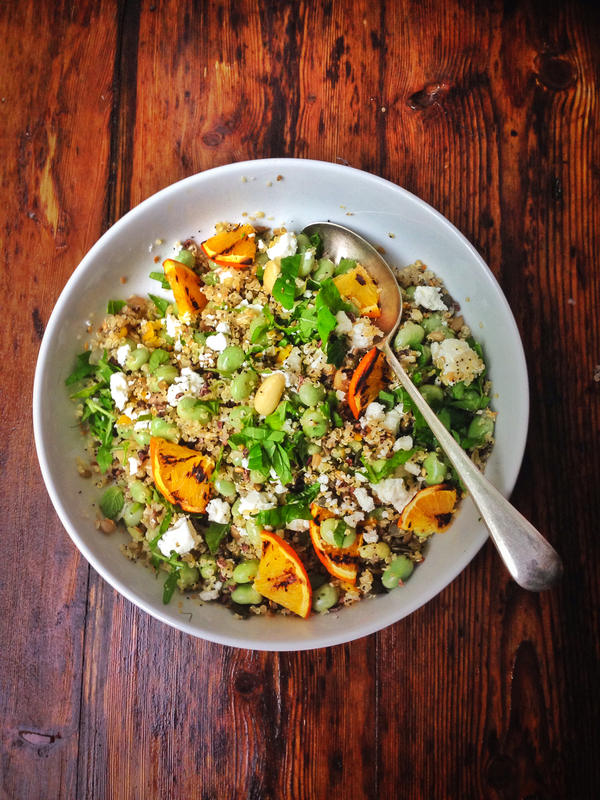 Usually if anyone mentions the word “Quinoa” I’m immediately turned off a dish, it’s often made so badly that it resembles a soggy mush of squirly disappointment but if cooked well and combined with some peaky flavours it’s actually rather nutty and lovely and this salad proves just that. Cook the quinoa according to packet instructions but add the stock to the water. Once cooked drain in a sieve and leave to cool completely, this will also help dry it out a bit. Slice the orange into rounds and sear on a very hot griddle, turning over a couple of times then slice each round into quarters. Combine everything in a bowl, you can drizzle a little extra virgin olive oil over if you fancy it, leave for at least an hour at room temperature to allow all the flavours to mix.